Home / Humor / India / Story / Petrol is not an expense:- Mind It, Indeed! 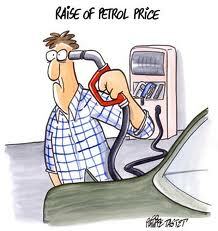 Petrol is not an expense:- Mind It, Indeed! Murli Deora and few others at OPEC has at least one gentleman to vouch for them and their idea of increasing the fuel price every now-and-then for some fun. Mind the words of this easterly brilliant mind when he delivered this path breaking statement (read them in bold and quotes too) to another hapless, perpetually confused entity, who has one confusion or the other for anything and everything in the face of the planet. I am not sure about the fortunate one who happens to be the first hand receiver of this bizarre piece of unintended gyan, but for most of the rest, I advise you to take this blog with a truck full of salt. But for the individual who later on gave him that valuable piece of gyan had decided to go with the option (d) and hence thought of passing on some silly economics and the subsequent finer points of assets and it's devaluation attached to it. The self belief of having the real reason in hand the coupled with the confusing attribute of the receiver the gyan session did started. First jargon that had to suffer the autopsy was our poor insurance companies. The mathematics of the premium paid to the insurer for the car which was never driven and the wastage of few thousands against it was promptly attached to the liability factor of the car. By the time our friend was finished with his assassination of the insurance companies, it was clear that, if you have your insurance and don't drive it, then you are the biggest fool that one can find. In the same line it makes it mandate to fall ill at least a couple of times of high magnitude in a year if you unfortunately happens to have one health insurance, or else that's a liability. Good logic, I must admit. Next belief to be rubbished is the whole idea of buying a car. If you are still getting drenched in rainy season after having a car, is as useless as running to participate in a sword fight with a fountain pen in your hand was his assertion of the confused brat buying the car. This theorem definitely has some credibility to ponder. The listener was enlightened with the fact that the price of the car in second hand market is bound to comedown, irrespective of it being driven or not, with every passing year. True again. Before the listener could reply back, the fuel factor a complete non issue for him, the gyan on fuel has already started. From the woodwork came that earth shaking statement "Petrol Is Not An Expense", not at least comparing against all the loss the poor chap bearing, just only by not driving his car, as proudly listed out by the brilliant mind. Even if guys like R.K.Pachori might just throw a heavy garland on this guy for not driving and adding few kilos of carbon particles to the atmosphere, our brilliant mind made sure our confused brat would look more confused than to begin with and that unspeakable expression of gratitude for being fortunate enough to sallow this million dollar gyan. As far as my enlightenment is concerned I never knew 50 multiplied by those many numbers (read liters), is never an expense. Good for our petroleum ministry and bad for those rabid mongrels of the Yadav colony and CPIM, who are fighting hard for a roll back. You need some serious counselling before you could open your filthy mouth next time confusing a whole generation by your lectures on the mayhem called fuel price. I don't know how it would workout, but would suggest to take some time out from your ever so busy strike and dharna schedule and talk to a certain Gyan distributor from our office. Thank you so very much !! I think the intention of the gyan guru over here was to convert most of the irregular car users into regular one's , so that he gets the mental relief that I am not the only fool who is spending so much on fuel.